The stage is empty (by empty i mean no play) it is getting ready for the penguin awards i will post pictures of the award ceremony as soon as they come out. Check out the puffle catalog, it looks awesome. now to the clothing catalog First, click on the pot of gold in the background to get a pot o’ gold. Now click on the word “MORE” in the penguin awards page for a boa. Next, press the “FE” in coffee for the spikester. Lastly, press the “R” in clearance for the fruit headdress. There are also St. Patricks Day Party decorations already being set up. Go check them out. What’s gentle yet powerful? Can turn anything to ice with a single breath? What can create snowfall, plays with a skate, and so much more? The white puffle! Do you know those puzzles where you have a picture with a whole bunch of stuff in it, and you have to find a specific thing? Well, the Migrator is a great place to play this game! Found all of these? Need one more challenge? OK, try and find the OTHER purple octopus. 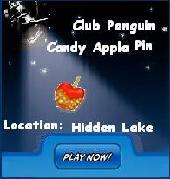 ok now A huge Member Event that’s coming to Club Penguin’s Stage. Many of you have been asking for so long for another kind of puffle to adopt, and I wanted to be the first to confirm that you’ll soon be able to make those mysterious white puffles your newest pets. On Friday, you’ll be able to visit the Pet Shop and get your very own white puffle from the Adopt A Puffle catalog!